Favorable conditions leading up to the Cumberland County and Sebago Lake Fishing Derbies are pointing to a successful time on the ice Feb. 16-17, according to the president of Sebago Lake Rotary Club, the derbies’ sponsor. “Last year, we ended up with 18 inches of ice. This year, it’s looking really good. We keep track of that and talk to the wardens up to several days prior to make sure conditions are safe,” Cyndy Bell said. 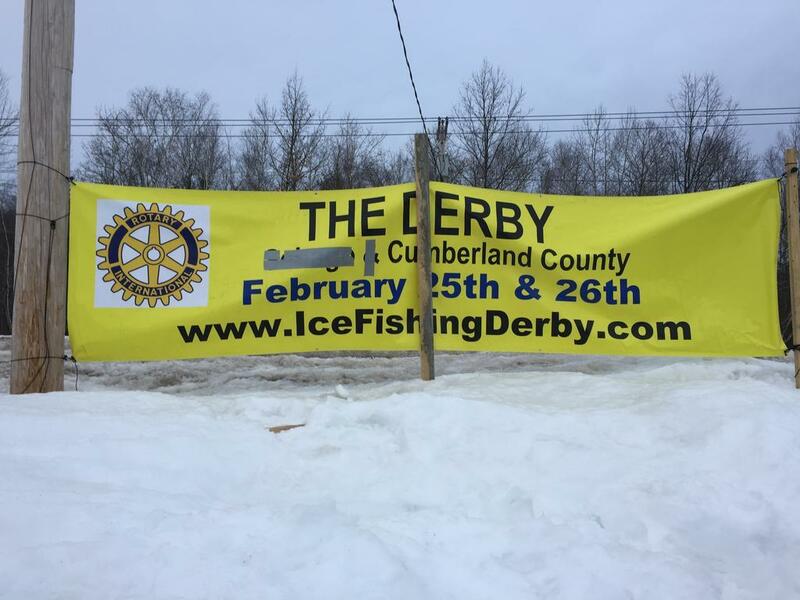 The Cumberland County Derby was cancelled in 2015 due to deteriorating ice conditions, and the Sebago Lake Derby was cancelled in 2012, 2013, 2016 and 2017. There are gift card prizes for the top three largest pike, perch (white or yellow), pickerel and togue. The largest prize is a $1,000 Kittery Trading Post gift card for the largest togue. Panther Run Marina has donated an outboard motor to the competitions, and fishermen will be entered in a secondary drawing for the motor. In addition, each participant will be entered into a drawing for a 2019 Commander ATV 500 from Windham Power Sports. The 17th annual polar dip to benefit children battling cancer and blood disorders will be held as usual, on Sat., Feb. 16, at noon at the Raymond boat launch. There will also be helicopter rides on Saturday at 11 a.m. on Raymond Beach. “We’re certainly hoping that it’ll be a good year,” said Bell, who is an advertising accounts manager for Lakes Region Weekly. For more information about the derbies and to register, visit www.icefishingderby.com. Signs had to be altered after the Sebago Lake Derby was cancelled in 2016. Fisherman on the ice in 2016 before the Sebago Lake Derby was cancelled. Dylan Dodge of Raymond brought in last year’s third-place pike after fishing on Sebago Lake’s Kettle Cove.